I’m conscious that there’s been a lot of 80s stuff on here lately. And here comes another one. I guess it’s no surprise given it’s the era when I was growing up, and that is an age at which music seems to have such a significant impact. The music you love at at that time lives with you forever, and it’s often hard to be objective about it. It becomes part of who you are, somehow written through you and in you. 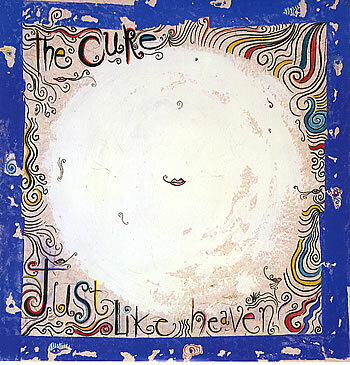 Just Like Heaven is an 80s song, from a band who were undoubtedly most prolific and creative during that period. My first awareness of The Cure was when their song Charlotte Sometimes (still a favourite) appeared on the early 80’s compilation album Modern Dance. I can’t say it turned me into a huge fan, but there was a run of singles through the 80s that was very impressive – songs like The Lovecats, Inbetween Days and Close To Me were all great singles, and there was a real sense of creativity and variety that came through what The Cure did, despite their being tarred with the “Goth” badge. Recently I’ve been digging back into some of the music of the early -80s that I missed, some of the post-punk music of the time, and along with bands like Magazine, Josef K and the B-52s, I’ve discovered that I *did* miss something with The Cure – albums like Seventeen Seconds, Faith and Disintegration are records I really love. Just Like Heaven is from the band’s 1987 album Kiss Me, Kiss Me, Kiss Me, which is probably at the poppier and more accessible end of the spectrum of the bands music (those terms are relative – this isn’t Bros or One Direction!). Apparently it is considered by the band’s singer and main songwriter Robert Smith to be one of the bands strongest songs. I don’t think anybody would much argue with that. It’s a simple and effective pop song, albeit one with a slightly opaque lyric which, according to Smith, is about “hyperventilating—kissing and fainting to the floor”. The Cure songs seem to translate well to the ukulele. The ukulele group of which I am a part, Southampton Ukulele Jam, regularly perform a version of Inbetween Days (listen here), and sometimes have a bash at Friday I’m In Love. Just Like Heaven scores quite a few hits on YouTube for ukulele covers, of which I think this has to be the best. Although I think this one captures something of Robert Smith’s performance. The song sheet is a relatively straightforward one. I’ve added in a transcription of the two solo sequences in the song as well, the first over the intro and the first instrumental break, the second combining guitar and keyboard solos over the second instrumental breaks. Enjoy! Categories: Indie, Post-Punk | Tags: 1980s, 1987, Indie, Post-Punk, Rock, The Cure, ukulele | Permalink. Occassionally I look through the stats for this site, just to see what people are looking at (if you’re interested currently Baker Street is the top downloaded songsheet, followed by How Long Will I Love You). It also shows some of the search terms that people have used that find their way to this site. Earlier this week I noticed that one of those was “life in a northern town ukulele tabs” – it had taken the searcher to the page for Julian Cope’s Head Hang Low, which contained a reference to said song due to the contribution of one-time Ravishing Beauty and Dream Academy member Kate St. John. And I thought – well, why not? Let’s give it a go. And here it is! 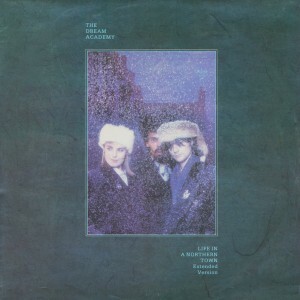 Life In A Northern Town was a 1985 hit (and really their only hit of any substance) for The Dream Academy. Their polished, sophisticated pop sound was akin to a number of other bands around at the time, including Aztec Camera, Prefab Sprout and Everything But The Girl. This particular song was apparently intended as a tribute to singer-songwriter Nick Drake, a deeply melancholic artist who recorded a number of rich and intensely personal albums in the early 1970s, but who never achieved any kind of significant success in his lifetime, and who died of an anti-depressant overdose at the age of 26. Since then his star has been in ascendence and he is now rightly reverred for his work. I remember buying the 12″ single version of this when it came out (I think it was probably from Henry’s Records in Southampton), and it has always been a favourite song of mine. The contrast of the windswept (yes, you can here it) downbeat and nostalgic verses with the upbeat, almost African / tribal chorus was a winner for me, and it was one of those songs you could play again and again and never tire of. If you get a chance to check out the couple of additional tracks on that 12″ (Test Tape No. 3 and Poised On The Edge Of Forever) which are just gorgeous. And so to the songsheet. This took a bit of working on, and even now I’m not convinced it totally does the job. But it’s good enough. First thing you’ll see is that there are a lot of chords, including some slightly unusual ones. No apologies for that, because I think they help contribute to making the song what it is. This is quite a subtle song, and those subtle chord variations are key to the making the song work. However, it’s not as bad as it looks – essentially the song is the chord sequence shown in the intro repeated, with a few subtle variations. And if you struggle with the Aadd4 chord, just play Asus4 instead – that still works. Also I should give some thanks to Tony Canova, the creator of this video, from which I stole a few ideas. Nice version, Tony! Enjoy! Categories: Pop | Tags: 1980s, 1985, Dream Academy, Pop, ukulele | Permalink. So here’s a clasic example of one of the reasons I started putting this blog together in the first place. This is hardly an obscure song. In fact I think the word “classic” is not really open to debate on this one. And yet could I find a decent, clear, consistent set of chords for it? No, I couldn’t. Probably there is one lurking out there, and probably I’m being a bit fussy, but here’s my take anyway. 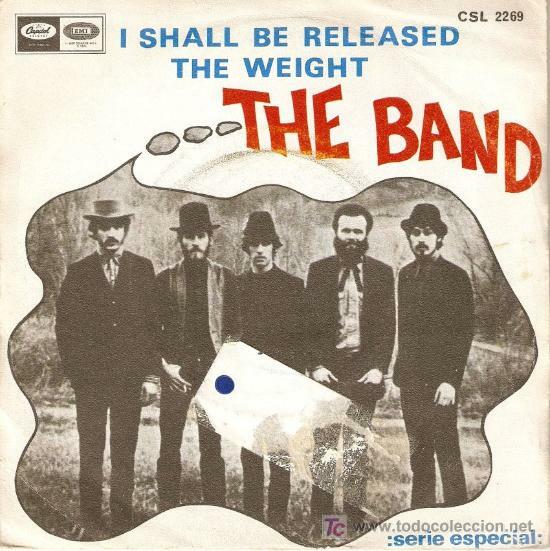 Wikipedia starts its entry for this by saying that “I Shall Be Released” is a 1967 song written by Bob Dylan. Well, that’s factually correct, I’ll give them that, but it all seems a bit terse for what is such a sublime song. The song has a real gospel influence to it, both in the musical structure of the song and in its lyrics, which combine themes of religious redemption with that of a man unjustly prisoned, looking forward to his release. There’s some heavy existential stuff going on in this song, yet as with much of Dylan’s material it’s not quite as simple and explicit as it might be in lesser hands, and leaves itself open to all manner of interpretations. The song was originally released in a version by The Band, who had acted as Dylan’s backing band on those infamous folk-goes-electric gigs. The keening, falsetto harmonies of that version give it an otherwordly feel that are echoed on the original Dylan version, later released on The Bootleg tape series. The song has since been extensively covered, with notable versions being made by the likes of Nina Simone and reggae band The Heptones, who lent it a lovely chugging rhythm, something repeated on one of my favourite versions by Beth Rowley. I couldn’t find a Youtube clip of the original Dylan version (try the Beth Rowley version for one in the same key as Dylan and the songsheet, or this Spotify link), but meanwhile here’s the classic version from The Band’s farewell concert, The Last Waltz. Featuring the massed ranks of Bob Dylan, Ringo Starr, Ronnie Wood, Joni Mitchell, Neil Young, Neil Diamond, Ronnie Hawkins and Van Morrison – my what a concert that must have been! And so here’s the song sheet. Nothing much to say about it, it’s a very simple song (three chords) with endless room for variation and improvisation. This is in the same key as the Dylan original. Enjoy! Categories: Folk-Rock | Tags: 1960s, 1968, Bob Dylan, Folk-Rock, The Band, ukulele | Permalink. Just for those who were wondering(! ), when the strap line on the web-site says “uke-ifying my favourite songs”, the classification of “my favourite songs” has been stretched a little. I certainly like all the songs that I’ve posted on here. In fact I’d go as far as saying that I love all the songs I’ve posted. But whether they’re my favourite, favourite songs is a little less certain. If that were the case today I’d be including things like Primitive Painters by Felt, Temptation by New Order, Goodbye Lucile #1 (aka Johnny Johnny) by Prefab Sprout and the like (a bit of an 80s theme there! ), although it would probably be a different list tomorrow. But the point is some of those songs don’t really translate that well to the ukulele. Or I’ve struggled to make them work for ukulele. So the songs I’ve posted here are songs that I like and I think work quite well for the humble uke. This David Bowie post is a case in point. If I was going for my favourite favourties I’d be posting something like Sound and Vision, Young Americans or Wild Is The Wind (or “Heroes”, but I have already done that one!). But those songs don’t really work for me on the uke. This one does, though. 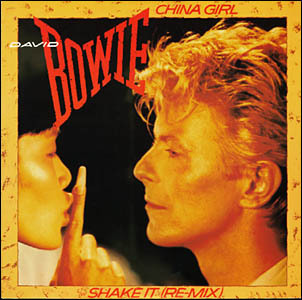 China Girl is a single from Bowie’s 1983 album Let’s Dance which, dependent on your viewpoint, is last album of his awesome streak through the 70s and early 80s, or the one where the rot set in. Certainly it was the one where Bowie became outwardly more focussed on a commercial sound and success (and boy did it work!). For me as an album it’s mixed – some great songs, this one included, but a fair bit of filler as well. China Girl was a joint write between Bowie and Iggy Pop from as far back as 1977, that was recorded by Pop for his Bowie-produced album The Idiot. As you might expect, the Iggy version has a heavier and darker sound. The Bowie cover (on which Iggy sings) benefits – in my mind, at least – from a shinny production (and guitar playing) from Chic’s Nile Rodgers, which brings the song alive and turned it into a huge hit (UK number 2, US top 10). It probably provided Iggy Pop with a very nice and steady royalty stream as well! So here’s the song sheet. It’s in the same key as the original (so you can play along! ), and follows the lyrics / arrangements of the original. I’ve also included the little intro riff that crops up throughout the song, and is really easy. One observation from when I play it – I think the Em / D / C / B sequence that crops up after the first break (there’s no real verse / chorus structure here) sounds best as a run up the fret board – i.e. Em as 9777, D as 7655, C as 5433 and B as 4322. Enjoy! Categories: Pop, Rock | Tags: 1980s, 1983, David Bowie, Pop, Rock, ukulele | Permalink.